Dribbble is one of the most popular design communities on the web. Every day, tens of thousands of users come to the site to post the designs that they’ve been working on, and other users from the site leave their comments on them. Although browsing the content is free, it still remains an invite-only community if you’re looking to post your own designs or comment on the work of others. 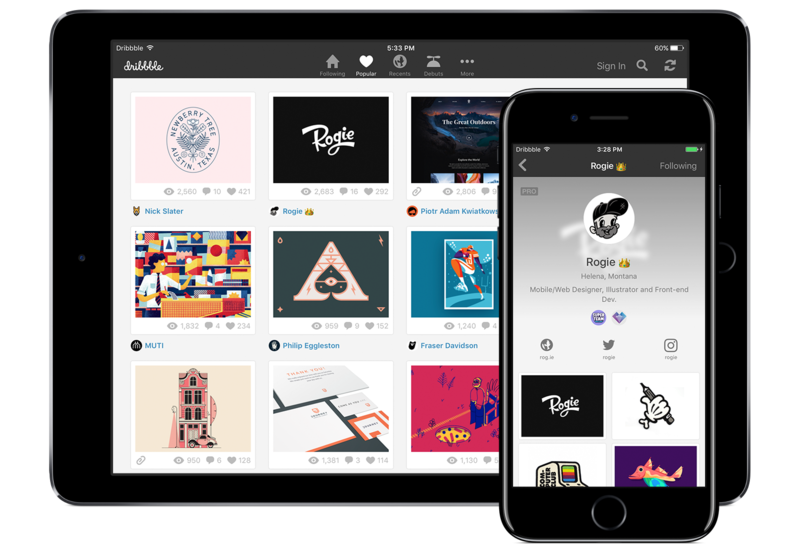 Founded in 2009, Dribbble has evolved greatly over the last few years, introducing a host of features and improvements to the site to cater to its vocal community. Although Dribbble has had an open API, and we’ve seen plenty of apps for Dribbble already, they surprisingly never released an official Dribbble app, until today. Available now on the App Store for iPhone and iPad, the official Dribbble App brings all the goodness and features of Dribbble to your iOS device. It offers a wholesome mobile experience, allowing you to browse all the content posted on the site on the go, no matter where you are. Featuring a customizable tab-based UI, you can browse shots from feeds like Popular, Recents, Debuts, Teams, Playoffs, Rebounds and even GIFs. If you have a Dribbble account already, you can login and also browse your Following feed in the app. You can also interact with the shots posted by users by viewing, liking or commenting on them, or adding them to your buckets. The official Dribbble app offers full support for 3D Touch, allowing you to quickly peek and pop on the shots. This is especially useful for quickly going through the plethora of GIFs posted on Dribbble these days. The app also offers support for Handoff, so you can continue browsing where you left off between devices. And thanks to the support for Universal Links, all Dribbble links open directly in the app instead of the browser. The official dribbble app is full of slick animations. Even basic transitions from screen A to screen B are beautifully crafted, delighting you during every interaction. Here’s my favorite one. The actual animation in the app is far more slick than it is possible to show via a GIF. I also love the way you can move or flick the posted shot around when you’re in the landscape mode to reveal the shot’s title and date. Here’s a GIF of that in action (7MB). If you look closely, the official app bears a striking resemblance to Balllin — a fantastic app for dribbble that debuted in 2012 and got a fantastic iOS 7 redesign in 2014. That’s because the official app is, in fact, based on Balllin. Devin Ross — the developer of Balllin has been brought on board by Dribbble to work on the official app. Right now, the official Dribbble app looks exactly like Balllin, except for updated glyphs and a few UI tweaks here and there. The app also does not support uploads yet, but Dribbble says this feature is coming in a future release, along with support for activity, push notifications and an official Apple TV app. Dribbble was recently acquired by, and is now a part of Tiny — the new parent company of sites like MetaLab, Flow, Designer News and Pixel Union. The official Dribbble app is available as a Universal app for Free on the App Store. Although, I still prefer Balllin’s original icon and glyph over the ones in the official Dribbble app.